This is my first attempt in Forest Service. I was very tired of giving civil service ( 5 mains + 2 interviews) and was in very desperate situation to clear the exam as I did not write civil 2018 mains properly and not cleared it. thanks to friends and forum IAS links, I cracked in this exam. my optional : geology and forestry. I never read geology before. Geology papers this time were little easy ( I scored 314/400) compared to previous years.However, you have to prepare thoroughly. There was 2 months gap for mains preparation (an added benefit if it is available this time also).But if time permits before prelims please go through basics of geology at least once. (e.g. general geology, geomorphology, remote sensing, economic geology and mining portions). Having geography optional in civil service exam helped me a lot in covering the syllabus quickly and have many revisions thereafter. 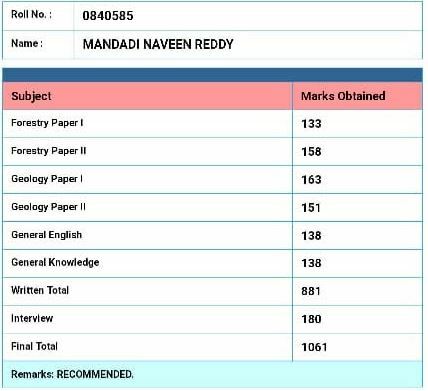 My strategy was to prepare on each and every keyword in the optional syllabus thoroughly and solving questions from previous years (this will give a lot of confidence). You can link concepts you read and apply them in your answers. For geology: Covers basics of geology from K M Banga, PK. Mukherjee for Indian stratigraphy and other selective readings. Tulane university geology notes is very good for adequate preparation. I have referred topper notes for topics like petrofabrics and read them extensively in my course of preparation. Refer to previous years topper notes on their respective blogs and i will share mine soon. I started making notes from these sources and memorized them in the morning. A lot of effort goes into memorizing topics like geology, especially indian stratigraphy and minerology formulas. Memorizing is very essential because without writing chemical formulas and other scientific names in your paper to fetch good marks. And also you have to practice at least 2 previous year questions from each major portion of syllabus. Draw a lot of diagrams in these papers. At least 3 or 4 neat sketches per question is essential, try to be creative in them. If you cannot come up with diagrams yourself, google images for ideas for the same. For Forestry: general strategy is same, i read from the must read manikandans book on forestry. I also did a lot of internet research on previous years questions which are not given in the book. I made short notes of each topic and memorized them. Please solve previous years questions given in the book. It will help to boost your score. Please do remember scientific names of trees and try to use them as much as possible. Learn concepts of forest economics and silvicultural practices and use them extensively in your answers. Again draw a lot of diagrams. and please use different colour pencils or black and blue combination of pens. It will give visibility to your paper. As far as gs is concerned: I went through previous years question papers and brain stormed their answers. You can read compilations of science and tech and geography concepts from NCERT. For other portions, Civil Services mains knowledge would be sufficient. Forest First Attempt; Passed out in 2012 and worked in power grid till 2016.